70.43 ACRES – RANCH HOME – POLE BARN – TILLABLE – WOODS – CREEK | Lawson & Co.
Saturday, April 27th, 10:00 a.m.
Tuesday, April 16th, 5:00 to 7:00 p.m.
Tuesday April 23rd, 5:00 to 7:00 p.m.
Parcel 1: 6.00± acres; well, septic, propane gas, & gravel/asphalt drive; one-story house built 1993± with 1817± sq. ft.; cedar exterior, updated roof, skylights, aluminum gutters, wood windows, crawl space, front porch, & rear deck; interior includes entry, living room, kitchen, laundry room, sunroom, three bedrooms, two full bathrooms, & one half bathroom; stove, dishwasher, disposal, fireplace, wood burning stove, water softener, 200 amp, propane water heater, & propane furnace with central air conditioning; two-car attached garage; 32’x48′ pole barn built 1990± with concrete floor, insulated ceiling, loft, & wiring. 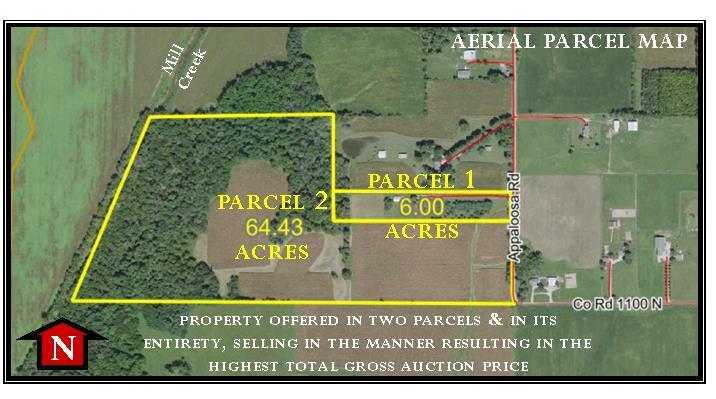 Parcel 2: 64.43± acres; 27.55± tillable acres; 0.8± CRP acres; woods; Mill Creek; primary tillable land soil types include Whitaker, Rensselaer, & Princeton; tillable land productivity index of 150.4; beautiful building sites; income producing acreage; recreational/hunting woods with trails. Directions to Property & Auction Site: From I-70, take the Little Point Road/Co. Rd. 1100 West exit. Go north on Little Point Road/Co. Rd. 1100 West approximately 1 mile to Appaloosa road. Go west on Appaloosa Road approximately 0.7 miles to the property. TERMS: Purchaser to pay 10% down day of auction with balance due on or before May 28, 2019. FINAL BID: Property to sell subject to final approval of the representatives of the seller. 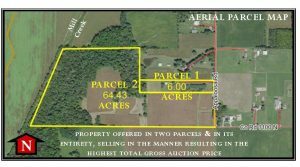 POSSESSION: Day of closing for improvements and non-tillable land, day of auction with release of liability for tillable land.